Last night temperatures dipped to or below 24°F for several hours at many locations throughout Kentucky (Table 1). 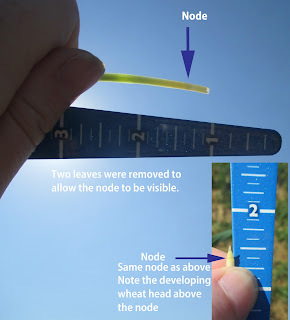 For winter wheat that has reached the jointing (Feekes 6) growth stage, damage (Figure 1) can occur to the developing wheat head, which is above the soil surface at jointing, when temperatures are 24°F or below for at least 2 hours. in February 2017. (Photo credits Yaziri Gonzales). wheat grain production. These aphid species overwinter as nymphs, and can be active when temperatures are above 45⁰ F. It is known that BYDV infections are more damaging when they occur in early growth stages of the wheat plant. Thus, aphids have more opportunities to infect young plants under this climatological circumstances. Table 1. Wheat plants at jointing (Feekes 6). Unseasonably warm temperatures in KY since wheat planting (October 15, 2016) may become a major challenge to wheat yield and profitability this year. Since Oct 15, 2016, KY has accumulated about 2000 GDD growing degree days (GDD) or heat units. In most years, only about 1500 GDD are accumulated by mid-February, while 2000 GDD are typically accumulated around the end of March in KY. These extraordinarily warm days and large number of GDD have resulted in wheat crops that are at a more advanced growth stage for this time of year. Typically, most of KY wheat in mid-February is beginning to break dormancy and initiate active growth: Feekes 3, Green-up. However, there are several reports in KY that wheat is jointing (Feekes 6; Figures 1 & 2). 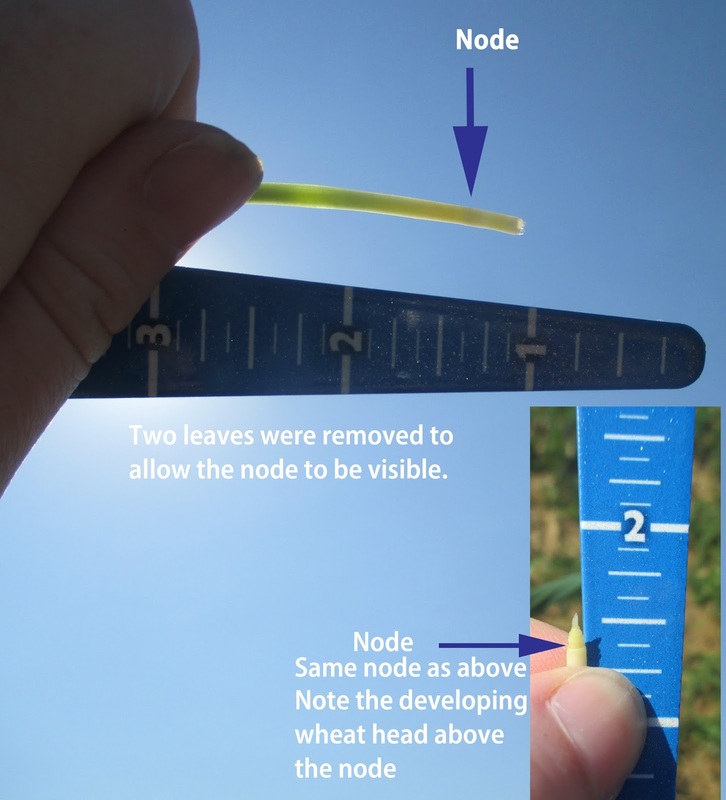 This is very concerning because at jointing (Feekes 6) the growing point (developing wheat head) is above the soil surface and is vulnerable to damage, including freeze damage. The risk of freeze damage is quite high because throughout KY there is still at least a 6 to 9 week window that a freeze typically occurs (Table 1). Figure 2. Wheat plant at jointing with dissected wheat head. Table 1. Probabilities for the date of the last spring freeze (32°F) in Kentucky based upon data from 1981 to 2010 (Arguez et al., 2010 provided by S. Foster, State Climatologist for Kentucky). Probabilities that the last spring freeze will occur on or after the date listed. For example, for 90% probability the last spring freeze will occur on or later than the date listed 90% of the time (nine out of ten years), while at the 10% probability level the last spring freeze will occur on or later than the dates listed 10% of the time (one out of ten years). • For wheat crops that have not received any nitrogen, consider a single nitrogen application as late as Feekes 6 or 7 growth stage. 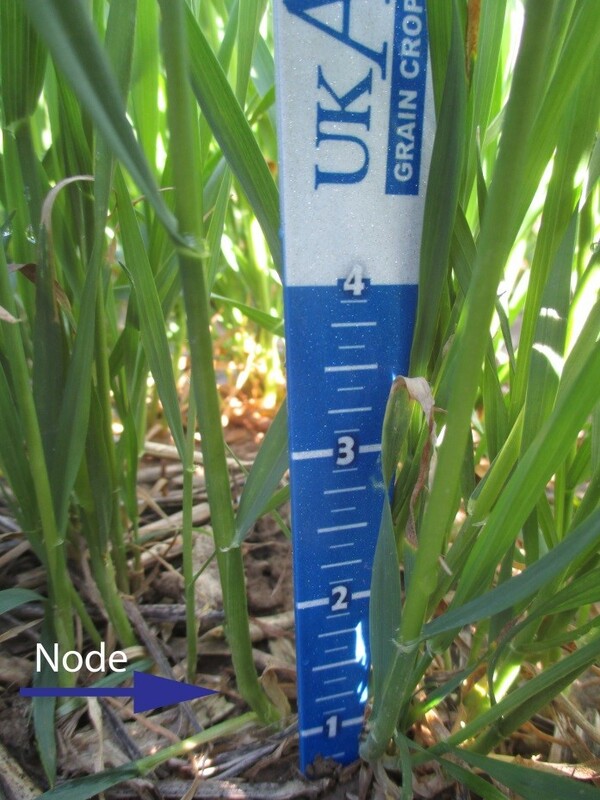 Delaying nitrogen application may reduce plant growth and the risk of freeze damage. as Feekes 6 or 7 with little or no yield reduction. provide additional freeze protection, depending on when a freeze occurs. • For wheat crops at jointing, Feekes 6, that have already received nitrogen applications, there is nothing that will protect the crop from freeze damage. The best approach is to consider delaying the second nitrogen application until Feekes 6 or 7, potentially reducing the severity of freeze damage. • Freeze injury occurs when temperatures fall to 24°F or below for 2 or more hours at the jointing growth stage: Feekes 6. • If freezing temperatures remain above 24°F there is only a slight risk of freeze damage. 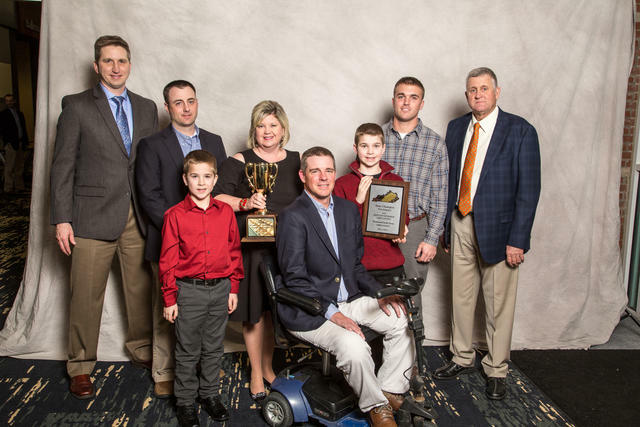 • In Western KY, the wheat crop does not appear to be as advanced as other areas of the state. Last fall there was a considerable drought that may have resulted in ‘dormant’ wheat in the fall (due to lack of water) when other areas of the state wheat was actively growing. These areas will likely be most profitable following ‘normal’ wheat management recommendations. • Be prepared to scout fields much earlier than usual for insects and plant diseases. The warm winter temperatures have also resulted in greater insect populations in KY, specifically cereal aphid species, which may increase the incidence of barley yellow dwarf virus. The state winner images and links to all photos are also linked here. 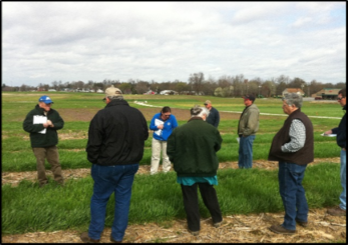 The UK Wheat Science Group with support from the Kentucky Small Grain Growers' Association will offer three hands-on training sessions on managing wheat in Kentucky - GREEN-UP (March 8th) - PRIOR TO FLOWERING (April 26th) - PRE-PLANT (TBA). These trainings are directed towards crop advisors and farm managers who provide agronomic guidance for wheat production. The sessions will be held on the UKREC Farm (1205 Hopkinsville Street in Princeton, KY) from 9am - 3:00pm CST (Lunch is included). Class size is limited to 30 people per training. REGISTRATION IS REQUIRED - see links below.